The next blow came from Apple – in June 2014 they announced that they are retiring their Lightroom competitor – Aperture. Another group was left disenfranchised, on the edge, looking for a solution that would work for them. Some moved to Adobe and swear by Lightroom to this day, others tried free options, including GIMP, usually finding them lacking. And so the market gap widened even more. This space was relatively quickly filled with Affinity Photo from Serif, which won Apple Design Award in 2015 and Best Imaging Software Award in 2016. It is indeed the next generation application that can freely compete with Photoshop – which id does, and pretty successfully I might add. Its main problem was that at the launch it was only available Mac users. True cross-platform solution was something that was promised, but not coming soon enough. Only at the beginning of 2017 the beta of Windows version appeared. Personally I am anxiously waiting for their DTP solution to see how it fares against Adobe InDesign, currently an unquestioned king of its own space – a title it righteously deserves. 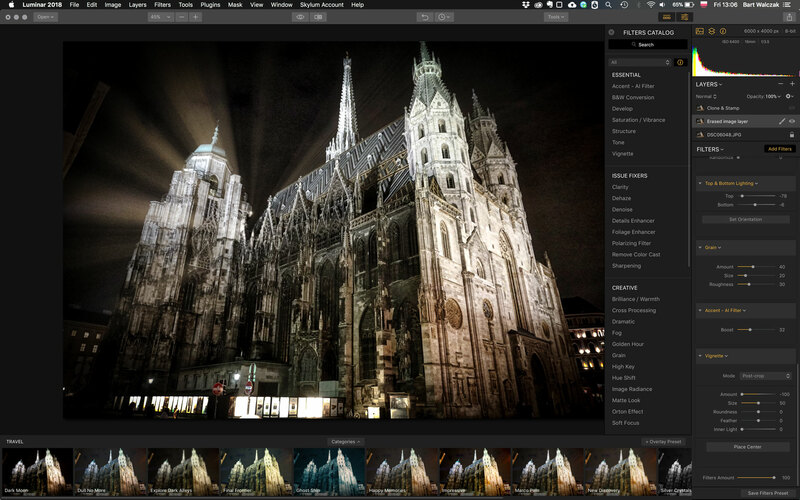 In the meantime, another company with some experience in writing tools for photo editing – Macphun, soon to become Skylum – also decided to go cross-platform and published two new tools – Aurora HDR and Luminar for both Mac and Windows. I was invited to give a test drive to Luminar 2018 (the second version of the product), and I did, curious what did the new generation of photo editing tools look like. When you launch Luminar for the first time, its interface looks pretty sparse. Where did all the tools go? What can I really do here? Thankfully, on the welcome screen, among immediately visible options there is a link that guides you to video tutorials on how to use Luminar, and if you are more of a cautious type, you might want to take a look at these. Myself – I just jumped in. Currently Luminar is just a photo editor – there is no management module yet, though the website promises there will be added somewhere in 2018. But right now the fun begins after you open your photo of choice. And when you do, the workspace changes a bit. On the right side of the interface the image histogram, layers, metadata and filters appear. At the bottom of the screen you will also see previews of already predefined presets. These are organized in collections, and are meant to be a starting point for creative exploration of your still images. When you click on one, the right side of the screen is populated with filters and we get to the nitty-gritty of what Luminar is all about. Alternatively, you can select a predefined list of filters from the tiny “Clear Workspace” menu under the Filters. These non-destructive, easy to use filters are the core of this application. This is no surprise – after all the company has been steadily releasing numerous award-winning tools and plug-ins for photographers since 2011. It’s only natural to create a single framework to rule them all. Each filter has several sliders, and some just one. This makes them very easy to work with, especially for people who are not power users, but want to achieve an interesting result quickly. Some of them are familiar (Hue/Saturation, Curves, Clarity), others are MacPhun’s secret sauce (loudly touted Accent AI filter). The names are pretty descriptive, the effects interesting. I have some gripes about the UI – the length and size of the sliders is too small for my liking. I would prefer more granular control without the need to be that precise. There are also options to remove, reset or deactivate a filter, and you can drag them around. All this is pretty straightforward. And when you want to see the great job that you have done, you can hit the Quick Preview button with an eye on it (or press “\”) for a sneak peak of before and after, or use the proper Before/After comparison with a divider. Ha! Chances are high that you will want to go beyond adjusting sliders in the presets, and start experimenting with the whole Luminar arsenal. To add new filters you need to – no surprise – click on the prominent “Add Filters” button. This is going to open a long list, and if you hover over the filter’s name, you’ll get a detailed description and a small picture that suggests its application. You can search for filters if you know their names or mark your favorites. The search box is almost always active, when this list is on screen, which unfortunately interferes with keyboard shortcuts, especially the Quick Preview. A photo I was playing with it. I’m no photographer, but I was curious where Luminar would take it. When you click on a filter name, it’s going to appear in the filter tree on the right at its bottom. For a moment it felt great, but pretty soon I wished I could drag a given filter from the menu between two other filters in the tree, instead of adding it at the bottom of the ever growing list, and then dragging them upwards. Managing a large filter tree is also something that could use a bit more love, as the tree grows extremely quickly. There is the “Single view mode” that only opens the active filter and minimizes the rest, but I discovered it by accident after looking for something else. It’s available when you click on the Filters menu. A keyboard shortcut here would be nice. What was not immediately obvious to me was that these filters are applied on a per-layer basis – at first I thought they affected the image as a whole, but when I started to work with other tools, I quickly realized my mistake. For each filter you can create a mask that will limit its application. To do that, you click on the brush icon that appears when you hover over the filter’s name in the list. You are then moved to the mask drawing mode, and can use a simple brush or choose a radial gradient or a ramp. The tools are rudimentary, but I guess enough for most of the things that you would want to do. Luminar also gives you some opportunity for basic layer work. There are blending modes (on filters too), you can change the opacity, scale layers, apply different filters to different layers and add layer masks. You can also create adjustment layers that are just layers holding filters, without any pixel content, like in After Effects. All of these are available through the Layer menu or the Layer palette above the filters. You have to actively look for most of these options. That said, the layers do not seem to play the central role in the Luminar experience. Apart from layers and filters, there are several other tools available: Crop, Free-Transform, Erase, and Clone & Stamp. Selecting any of them hides layers, filters and presets, opens a small settings bar for each tool, and focuses on the picture. It might be a bit strange at first, but in the end the paradigm of showing just what you need is nice. Crop and Free-Transform tools are pretty straightforward with all the options that you might want perhaps except the perspective correction. The Eraser works like Photoshop’s Content-Aware Fill – you paint an area that you want to get rid of and the program attempts to fill it to the best of its ability. The results seem to be similar to what you can achieve in Photoshop, and even though it’s not very fast, it can serve as a basic retouching tool. On the other hand, Clone & Stamp is pretty basic – there’s just the brush size, softness and opacity. Good enough for occasional corrections, but missing at least blending modes for more serious work. The unfortunate part is that when cloning or erasing, the whole layer is duplicated, so if you applied filters first, and then decided to clone something, you have to save the filters as a preset and apply this preset to the cloned layer or use an adjustment layer. This feels a bit excessive, even if understood. Certainly a dramatic effect is there, even if it was just a casual play. Once you’re done with your corrections, you can save the file in Luminar native format, but also export it, using a pretty basic export window, share on one of your typical social sites or just send to Photoshop, Photos, Aperture, Lightroom or any other MacPhun application for further work. When I started exploring Luminar, my curiosity was very quickly tempered with the perception of slowness that accompanied most of what I was trying to do. I felt thrown back to the early 2000s, where I had to wait a second or two after each update to have image reflect my changes. The work was not smooth, especially when I started playing with masks, eraser and clone. And yet still I kept on going. The novelty factor and being intrigued what can be done with the assortment of filters made me delve into the software a little more. Obviously it has that “something” that got me hooked. And yes, exploring various possibilities was actually fun! Creative effects that usually involve more complex work and careful planning in Photoshop or are not available in Lightroom at all in Luminar require a click and moving one or two sliders. This way you can explore multiple options with ease, see which seem to be the most interesting ones, and in general get to the desired state faster – despite the perceived slowness of the program. It’s when I wanted to do more, to bend Luminar to my will to do tasks that it was probably not destined to do, things started to go awry. Eraser tool and working with layers are tedious and require much patience. Masks are also quite frustrating if you want to do something more advanced. I guess going 90% there and then moving to Photoshop would perhaps yield better results. But then you lose all this flexibility and non-destructive workflow. I quickly resigned myself to one layer with multiple filters approach. After creating a look, it’s easy to compare it with original. But how do I save my choices and then compare them to different ones? I can do it by saving presets and switching between them, but it’s not ideal. I so wished to have the versioning capabilities from Resolve, and being able to compare them all at once in a single window. That would be the cherry on the top. Time passed, and I was having fun with Luminar, pushing it to the edges, and at some point have gotten used to its latency. I accepted the tiny sliders, learnt to hide filter library when I wanted to compare before and after, and in general started to enjoy the process. My wish list did not disappear, but it did not prevent me from experimentation. I used the application on a few stills beyond my testing just to see what the options were, and that also speaks volumes about the Luminar’s appeal. In the end, though, I decided to compare apples to apples and then to oranges, and worked with the same image in Photoshop, to see what I can pull off over there. And that experience was a bit sobering. Gee, Photoshop is fast. None of that waiting when I adjust things, the feedback is immediate. With five sliders in CameraRAW I got roughly where I wanted, and then just added saturation and contrast curve. And… I was almost there. What’s more, CameraRAW automatically selected lens profile from my metadata and applied undistortion, devignetting and other lens corrections for me. And that was the moment when I started to wonder – is it really worth it? Exploration is fun, indeed. Ease of wrecking or improving your photos in various ways is certainly appealing, especially if you are not a Photoshop power user. But when you are? Then I launched Lightroom CC, the new simplified one, and did the same thing there. Again, much faster than Luminar, much easier with more readable UI. Yes, no access to the artistic filters, yes, you have to know what you are doing to achieve a similar result, and no, it will never be exactly the same. But all the controls are faster to access, the feedback is immediate, there is an additional ecosystem that manages your media. In the end all that seems alluring in the world of thousands and thousands of holiday pictures. Finally I remembered another tool that I have never used for photo editing, but that I have installed – Magic Bullet PhotoLooks. I opened that application, browsed through its presets, and immediately noticed that they go far beyond what Luminar offers. It’s a different paradigm, Stu Maschwitz is trying to mimic the effects of various elements of a film camera rig, but again, it is faster and more courageous with its tools and choices. Granted, it’s part of a suite of video plugins that cost around $500, so the comparison is not necessarily fair. And yet, coming back to Luminar made me feel like the sliders in their filters do not go far enough. I was still curious, however, what would other people say about Luminar. My partner used to work as a graphic designer and takes a lot of photos. I believe she could have been a professional photographer, had she chosen this path, but for her it’s more about the overall project than just photography. She also enjoys working with clay much more, so the great photos usually end up buried somewhere on one of numerous hard drives or as part of her other projects. She is an apt Photoshop user, but spends most of her time in ACDSee Pro, as it is the fastest image management program that we have found and have been using since version 3.2. I asked her to spend half an hour with Luminar to see her impressions. I would also have the cross-platform comparison, as she is an adamant Windows person. She confirmed that the program felt slow and that it was the major hurdle for her, preventing her from deeper exploration. On a positive note, some effects were clever and allowed to achieve interesting results with ease. She shared some of my UI concerns, especially about managing the filter tree, but didn’t think the controls were too small. In the end though, Luminar would definitely not replace Photoshop (“never” was her answer) or ACDSee’s editor (even though she does not particularly like it). Where does it leave me in the end? It feels like I am not the target user for Luminar. I already know too much, demand too much, and I am not keen to wait. I also have access to tools that its target audience most likely does not, and I am spoiled by the ideas from the film world. I don’t see myself as its frequent user, I might occasionally open it up for a particular effect or to play around. In my dreams I’d have all of these plugins available as adjustment layers in Photoshop. This, however, is most likely not going to happen. I think Luminar very quickly grows on you and can be an amazing gateway to creativity when it comes to photography. Professionals might complain about the lack of total control, but others will simply embrace the creative freedom that is being offered. It is a promising piece of software that seems to have “that thing”, but needs a bit more love to smoothen out the rough edges here and there. 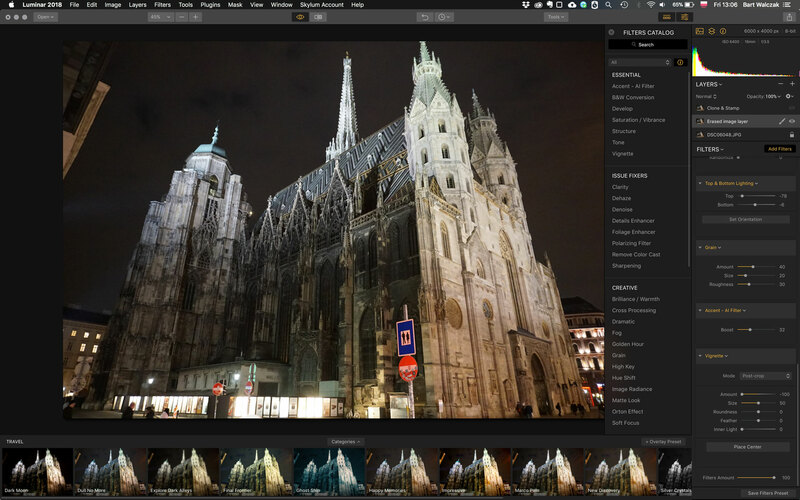 If you don’t want to pay Adobe subscription fee, are looking for Lightroom replacement and can live with some limitations, or maybe just like one of Luminar’s great filters, it might be a tool just for you. I am extremely thankful to Luminar for reminding me that photo editing can be fun and amazing process of exploration and for this great trip. This feeling by itself, something that no other software has been able to provide, was worth the time spent using it. 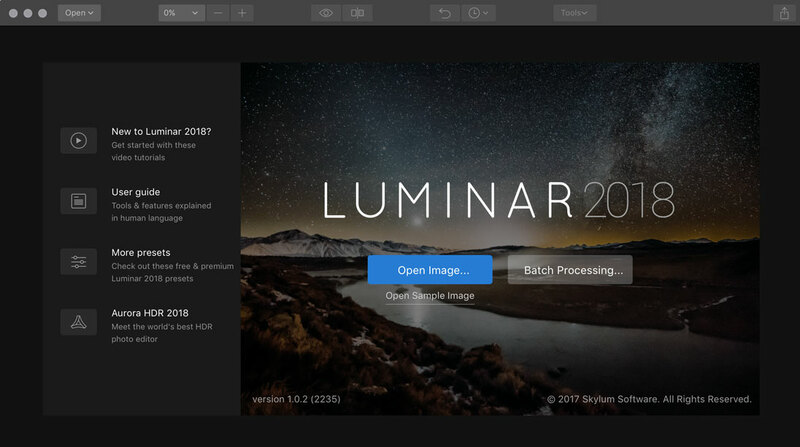 Disclaimer: I did get to keep the review copy of Luminar 2018 sent to me by MacPhun. Tagged Lightroom, Luminar, MacPhun, photography, Photoshop. Bookmark the permalink.